There has never been a better time to visit Paternoster than now. South of Africa is proud to announce the official opening of their brand new Abalone Pool Villas in the heart of the West Coast fishing village on 17 July 2017. 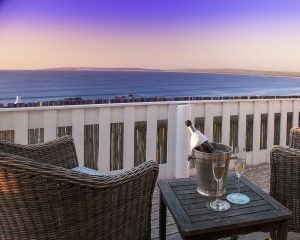 Previously trading as the Seaside Cottages, the renovated and revamped units have been turned into opulent seaside escapes, with luxury interiors and modern amenities ideal for families and friends. Carrying through with the Tretchikoff theme that is prominent in the décor of the nearby 5 star Abalone House & Spa in Paternoster, the new look Abalone Pool Villas approached the theme with a touch of seaside living. Inspired by the neverending vistas of the Atlantic ocean, guests will feel right at home in the new Abalone Pool Villas. Each of the two air conditioned bedrooms offer a King Size bedroom with flat screen TV and en suite bathroom. The bed configuration can also be changed to offer twin beds. The main bedroom’s bathroom offers a shower, bath and double basin, while the second bedroom’s bathroom offers a shower, and single basin. There is also an additional guest toilet in each unit. The living area looks out onto a sparkling infinity pool with outside braai, seating area and outdoor shower. The living area boasts a state of the art Smart TV, which includes the world famous Netflix streaming service and select DSTV channels. There is also complimentary Wi-Fi available. A small indoor slow combustion fireplace sets the mood during the winter months, giving guests both the comfort of home with a sublime view of the Atlantic Ocean. The Abalone Pool Villas are also family-friendly. This makes these units the perfect escape-to destination any time of the year for families with teenagers or groups of friends. The Abalone Pool Villas also include a unique breakfast delivered to the units daily from the Reuben’s Restaurant, enhancing the familiarity with Abalone-brand and making it the most desired West Coast experience. Despite the inclusive breakfast, each unit also offers self-catering facilities and a range of state of the art equipment, including a dishwasher. Each Abalone Pool Villa also offers butler service and a valet parking service. The Abalone Pool Villas opens on 17 July 2017 and embraces winter with a fabulous opening offer of only R6000 per villa per night, valid for stays until 31 August 2017. The rates is for 4 people sharing and is inclusive of breakfast. Book online today.